Swing by and sample our delectable sauce, stop to sip some spirits, and then buy some bottles of both to bring back to your abode. Love That Brand New Sauce Smell! It's been a big week so far, and will be getting more exciting as it progresses. The construction work at the restaurant is coming to an end and we have our first event on the 9th. The work being done looks great and will steer 350 Main for the next 20 years. Our daughter was finally discharged from the hospital and is now at home. She has really been packing on the weight, and is almost triple her birth weight of 2# 13oz. Her first night at home was a fussy one, but we are going to her first appointment with her new pediatrician, and it's just wonderful to not have to drive an hour each way just to see her. Edit-we just got back from the doctor and her hearing is normal. She failed her hearing test on Friday, so that 's a relief. The new production day is being scheduled for the end of the month, and I have the private party on the 9th, restaurant opening to the public on the 13th, and then Savor The Summit on the 16th. It will be a really intense couple of weeks leading up to the full day production but will be worth it. Ostensibly we will never close down for the spring time again, which will be nice because doing a full open every year is pretty stressful. We are doing two big things this year in the kitchen at 350 that I am very proud of. We are going to start making our own bread and making our own french fries. It has been something I have wanted to do for years, but working out the logistics has been the problem, and now with encouragement for Rob at Alpine Distilling we are pressing forward. I have done it in restaurants before, but now that the iron is hot, the pump is primed, and the dangle is angled, it is time to refocus corporate personnel and empower their time resources to make hay and shift our paradigm to one of scalable efficiency and bleeding edge culinary prowess. I have two more sauce recipes solidified, and one more I need to tinker with. 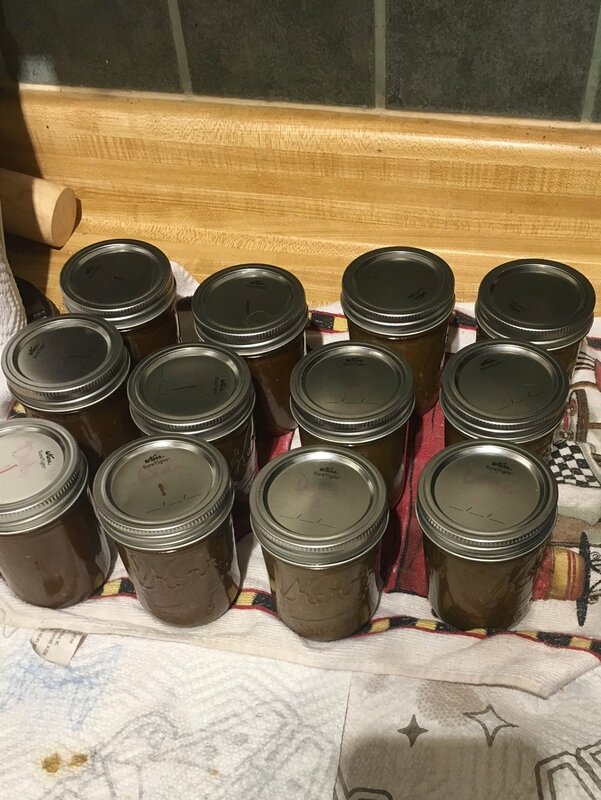 The tinkering sauce is just like Grandma Fitch's, in that it was not originally developed for mass production, and needs some tweeks to make sure I am pulling maximum flavor out of the aromatics while not having to cook batches for hours on end. It's a delicate balance, but once it goes into production it will all be worth it. Short update today. We are slowly ramping back up. We had to cancel our production day due to an emergency, but are in the process of scheduling a new one. In the mean time enjoy this picture of the garlic-Parmesan fries from my day job at 350 Main Brasserie. We are all set up with our volunteer times for Give Kids The World when we go on vacation to Florida. They organize their shifts into smaller 3-5 hour segments and we are doing two short ones back to back. The first looks to be assisting in some capacity for a Disney character meet and greet and the other is in one of their many food service outlets. Give Kids The World Village is an 84-acre, nonprofit resort in Central Florida that provides weeklong, cost-free vacations to children with life-threatening illnesses and their families. Give Kids The World not only hosts American families but also families from around the world, so if you are multi-lingual and are looking for a way to give back while on vacation there are opportunities to use those skills. Over the years they have hosted over 160, 000 families from all 50 states and 76 countries. Give Kids the World was founded by Henri Landwirth, an amazing inspirational human and a five year survivor of concentration camps during World War II. Knowing how hard a traumatic childhood event can be, Henri opened the Village with help from friends inside the Hotel and Tourism industries in 1986 on 31 acres in central Florida and it has grown over the years to 84 acres. Henri had owned the Starlight Motel in Cocoa Beach where he hosted the Mercury 7 astronauts including future GKTW board member John Glenn. Later he would own a hotel in Orlando where he would occasionally host children with life threatening illnesses and their families. Unfortunately, one child, who Henri had secured a place to stay for, succumbed to her illness before all the other arrangements could be sorted out for her to come down. This loss spurred Henri into developing GKTW and a child and their family can be hosted with 24 hours notice, free of charge. The families are provided with tickets and trasportation to area attractions and there are many places to play on property, since the grounds are a mini theme park. There are several places to eat including an ice cream parlor that opens at 7:30 in the morning, because if the ill child wants to have ice cream for breakfast, they should have ice cream for breakfast. The child can also elect to just relax in their room if they are not feeling up to going out and their family can get distractions that they also could use. Other onsite things for the kids include spa days with make overs into princesses and pirates, talent shows, and just watching a movie in their theater. You can donate money directly to Give Kids The World, donate your time while visiting the Orlando area, or start your own fundraiser. I am going to be putting some new designs on some shirts and making them available in tall sizes since there have been requests. I have also adjusted the prices on current inventory. Work is winding down as we get ready for mud season here in the Wasatch. I played around with one of my demo sauces that I have been working on and made something with it that was not just the sauce on a piece of meat. I also hope to have some more recipes for things to do with Grandma Fitch's Gourmet Cocktail Sauce available in the near future. Simmering shrimp shells, coconut milk, and chicken stock. The finished dish with jasmine rice and sweet potato. Could have used some cilantro. I have been fitting in development for future sauces when I have time. The steak sauce is still not where I want it and I cooked a new, different batch last week, but think I will have to do a few more little mods to it still. We will see. I also put down the first batch of a curry based sauce, but I know that is way off and I already know some changes I want to make for the next few tests. I ordered some kola nut powder for a sauce I have been story boarding and will order ingredients for another sauce I have been making since my Martha's Vineyard days, which should be fairly easy to nail down in terms of product development, but now that I said that it's probably going to be a nightmare. In other entirely unrelated and inane news, yesterday marked 60 days out from my vacation, so I did our Fastpass+ selections. I did them only for the days when we are definitely going to the parks for dining and leaving the others blank, to give us freedom to do or not do things the other days, especially since I know we are going to make a trip to Tampa and meet up with some friends(and eat), and we need to do at least one day at Universal. The other thing we are going to be doing in Florida, is volunteering for a shift at Give Kids the World Village. It's a great non-profit that pairs with wish giving charities for families with children who have life threatening illnesses. It allows them to visit the parks of central Florida, and provides them with a great vacation with plenty of entertainment if they are not feeling up to all the hubbub of Walt Disney World, Universal, and SeaWorld. "It's like salsa and cocktail sauce had a baby!" The first few orders have shipped and I am pretty stoked on that, I have finally picked up the remaining bottles from the copacker and have them all stored away properly. They are currently available for sale at the restaurant, too. I really wanted to say how fun it was on the production day working with the crew there, I helped with cutting the vegetables, stirring the sauce as it cooked and also helped with the bottling. I did not feel like I was in the way at all, either, thanks to my professional cooking background. I want to help out every time we bottle if that is a possibility. It's just fun being in there and seeing a different side of food production. I dropped off a couple of bottles with my local grocery store. I have somewhat of a friendship with their cheesemonger, from back when we used to have a cheeseboard on our dessert menu at 350 Main Brasserie, and hopefully I will find my way onto their shelves in the near future. She gave me some advice as to other-things I should prep in the way of presentation materials for sales pitches, which in all honesty are not my strong suit, but at least for now are something that I will have to handle and develop proficincy at. The best cocktail sauce money can buy. Full stop. 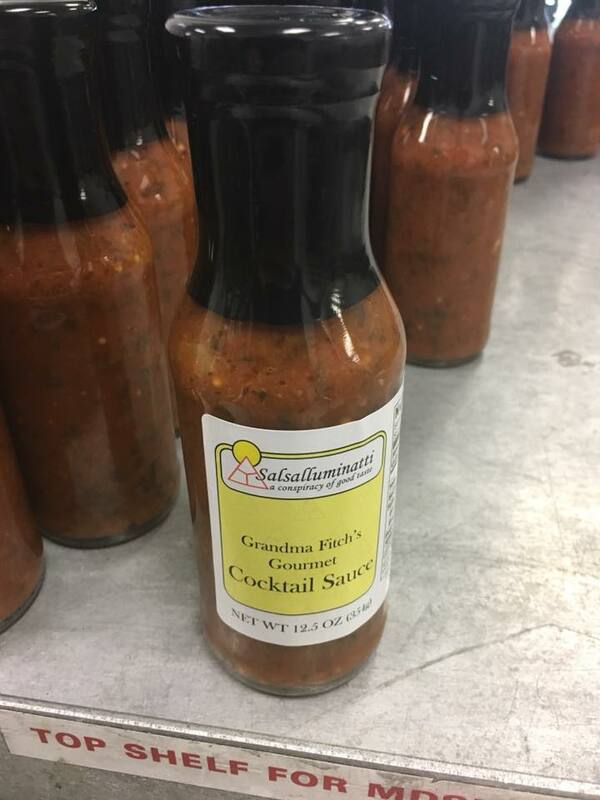 We are live with a limited batch of Grandma Fitch's Gourmet Cocktail Sauce for sale. Please feel free to stock up on it, some sparkling rose, and the shellfish of your choice. Make the jump and drop some dough. Something, something, (insert Joan Crawford reference here). Well, Sundance Film Festival is over and we did great at work, what with all the parties and what not. I finally did the two-week test of the steak sauces and what I thought would be the sauce I wanted to build on has dropped out of the running. Too many of the flavors intensified over the course of the two weeks and became cloying, even on a piece of meat. So I am going to take one of the sauces that I wasn't sure about initially and build upon that one. The flavors in it became quite enjoyable, it just needs a little more pep. I am also going to test them after having sat in the refrigerator to see if any of the flavors close up. Anyhow. The big test run on the cocktail sauce is next week. I have a new and improved batch of labels ready to go, and t-shirts should be available in the next few days. Not a whole lot to report. I am scheduled to do a large scale test batch on the 7th. And then hopefully stepping up to a full production, based on the results of the big test. Update 1/9/18- So I have tasted all these batches freshly made and I think the sweet spot is a combo of the first batch and the sixth batch, but will wait to judge and do new modifications until they have rested for two weeks. Sixth was awesome, but needs a little pick up from the first recipe. Played around with a sauce I've been formulating in my head. It's a steak sauce and the first two recipes tasted great, but are not what I want. I will do three other recipes tomorrow and up this date then. I will give them all a retry in two weeks since I'm canning them to see how they develop in the jar. Yes, I have the Star Wars paper towels. Good news this week. I set up a production run of T-shirts at a local print shop and should have them by the end of the month. I am starting off with the current logo on old school baseball t-shirts. I have a few other designs ready to go, but of course, will wait to see what demand is like. I should be in the lab on the 31st of January or the 6th of February for my 200# test batch. Once that's all set, then I move up to a full production run of sauce. I have all my runs for my April half marathon done for the week and I am well on schedule. If you haven't already, and I know you haven't, please take time to swing over to my donation page for Kellsie's Hope on Firstgiving. 100% of the proceeds go to Kellsie's Hope to provide families with children undergoing cancer treatment with much needed vacations, money for childhood cancer research, and scholarships for youths going into nursing. We just finished with the Christmas vacation rush at work, and it was aggressively busy, as usual. I finally have a night off and I am currently awaiting a fine pizza delivery service to bring me a "light snack." When I haven't been busy with my regular job I have been focusing on some graphic design work and recipe ideas for future products, so I am not really resting a whole lot, but that kinda comes with the turf. My training for my half-marathon at Walt Disney World has been going swimmingly on top of everything else I am doing and in two weeks we will see the start of the Sundance Film Festival which will bring another round of madness to town and then it will be busy, but not painfully so like it is during Christmas break and Sundance. Still waiting for word from my co-packer as to when I can get in for the next phase of product development. I'll be honest, it's not taking longer than I thought it would, it's been taking a whole lot longer, but such is life. The design work I've been doing will probably see some t-shirts soon. I'm pretty stoked on them and can't wait to get them up online, but not nearly as much as I would like to get sales of my first sauce going. I did get a few comments from people concerned with Disney's use of magic and idolatry which, I guess, when you put anything out there you will incur the attention of well-meaning if quite a bit misguided individuals. For Want of An Adjective. I have never been to Nashville. I have been to KFC and had what they call Nashville Fried Chicken. My understanding is true Nashville Fried Chicken is supposed to be aggressively hot and tossed in melted lard. KFC was an oily unspicy mess completely lacking any heat and wanting entirely for the taste of rendered pork fat. As soon as the label is finalized I can move onto a big test batch production. I am still waiting on the FDA to approve my home office as storage space for internet sales. I love buffets and I love breakfast, which is why I avoid them generally. I can eat all that I want of what I want until I hate myself as much as I want. This isn't to say that you, as an adult, cannot develop a strong emotional connection to the iconic Disney treats. As a matter of fact, my love for these did not start until I was older. My biggest Disney food memories as a kid were the Biergarten and the now defunct Alfredo's at Epcot. Go figure that the kid who ended up as an alleged chef remembers sitting down to eat at the nicer places and watching his dad chow down on calamari tentacles.